The National Recovery Administration created a Code of Fair Competition for the Crepe Paper Industry, 1933. The National Recovery Administration released a code for crepe paper manufacturers regarding competition, price setting, and the state of the industry in light of the Great Depression. Although crepe paper reached the peak of popularity at the end of the 1920s, it did not fade completely from view. Competitors under the Crepe Paper Industry Authority were to follow guidelines for prices, minimum hourly wages, as well as advertisements. The NRA dissolved in 1935 when the Supreme Court ruled it unconstitutional. As for the Crepe Paper Industry Authority, major brands like Dennison withdrew from the agreement, but in 1946, the Federal Trade Commission charged that they “engaged in unfair methods of competition in violation of the Federal Trade Commission Act.” This involved alleged violations of price setting rules and federal standards for the size and creping ratios of the paper. Dennison and other companies were in violation of fixing prices to suppress competition, but because they withdrew from the Crepe Paper Industry Authority prior to 1939, they were not issued an order to cease and desist. By 1957, Dennison was concerned about its losses in crepe paper, and it sought the advice of the marketing expert Ernest Dichter and his firm, The Institute for Motivational Research. Dennison hoped to understand the problem and hear suggestions to revive demand. The Institute’s report concluded that in order to revitalize crepe, Dennison needed to complete an entire rebranding process. This involved marketing the material as a craft activity that could connect mother with child. Crepe paper was then no longer an element of fantasy central to the “saturated world” of women’s social lives; it was no better than an ordinary craft supply. Contemporary crafters use crepe paper. Photograph by Kara Whitten, from her tutorial on A Beautiful Mess. As recently as March 2018, crepe paper was in the popular imagination of online crafters. The women’s lifestyle website A Beautiful Mess posted instructions for creating a crepe paper garland, suitable to hang above a fireplace or elsewhere in the home. 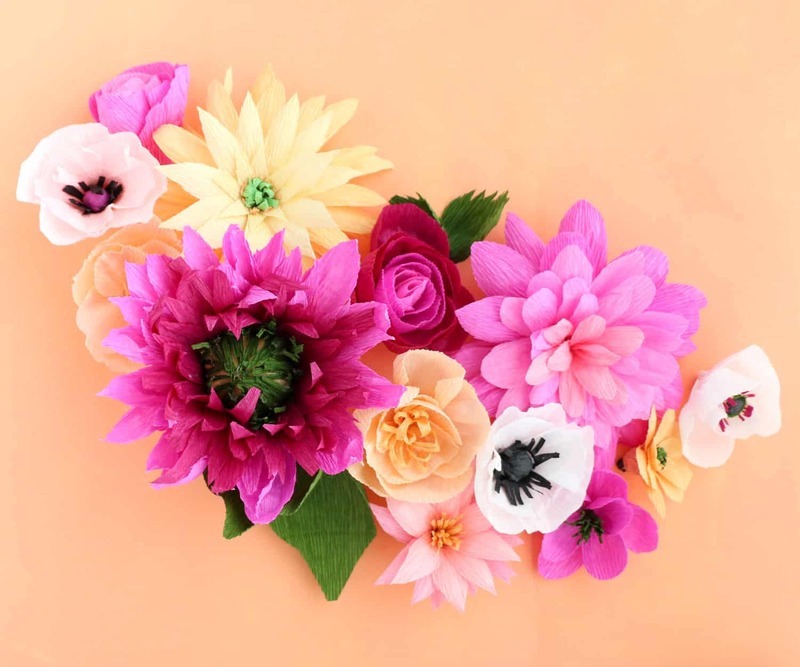 The instructions, illustrated with bright, magazine-quality photographs, walked readers through steps required to twist and shape paper into three-dimensional flowers. Unlike instructions from the 1920s, the author encouraged crafters to use a hot glue gun. Ultimately, the effect was the same: the small imperfections were disguised in the larger visual “eye-delight” of the artificial floral garland. From its introduction in 1890 in Boston, Massachusetts, to its decline throughout the United States by the mid-twentieth century, crepe paper was a material that was inherently disposable, accessible for all skill levels, with a playful element that appealed to consumers. Not insignificantly, its use in parties underscored the veiled nature of women’s work while relying upon a cultural dynamic that stressed novelty and domestic competition among friends and acquaintances. Today, as the craft movement continues with the presence of online instructions and marketplaces, crepe paper offers us the opportunity to reflect upon the complicated relationship between marketing, novelty, and social celebrations. Crepe paper’s ubiquity now, as a material suitable for ephemeral craft projects such as paper flowers, indicates that its place as a simple-to-use material has not faded in the present. Nevertheless its lessons about consumer waste, domestic labor, and creativity are enduring. National Recovery Agency, Proposal for a Code of Fair Competition for the Crepe Paper Industry,” August 30, 1933. “Fort Howard Paper Co. v. Federal Trade Commission, (7thCircuit Court,1946), https://law.justia.com, accessed May 2018. Kara Whitten, “Make a Crepe Paper Garland” A Beautiful Mess, March 14, 2018, https://abeautifulmess.com, accessed May 2018.